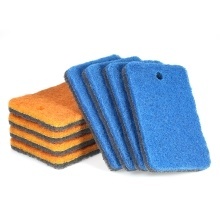 Pack of 8 scrub sponges can meet your demands of whole house cleaning! They can rub the stains and dirt easily and quickly. Perfect choice to clean dishes, pots, car, wash basin, table, glass and much more. Pack of 8 Scrub Sponges: buy 8 cleaning pads one time to satisfy your needs of whole house cleaning, the colors will be sent in random. Wide Application: to wash dishes in kitchen, clean wash basin in bathroom, wash car in garage, etc. Can be applied in anywhere. Good Sponge Material: both faces are made of sponge material, no odor and no toxic, easy to clean and dry, and not easy to deform. Different Material Densities of Two Faces: the density of one face is a litter higher than the other face, which makes it can meet different cleaning demands. Superior Cleaning Performance: scrub surface design allows it to rub the stains and dirt easily and quickly, and help eliminate odors as well. Safe to Use: powerful scrubbing surface with proper hardness, won&apos;t scratch your hands and any surfaces that you clean. Easy Storage: with a hole on top, convenient to hang up on hook to dry.